Welcome to BME at Rensselaer — home to one of the oldest and most reputable biomedical engineering departments in the United States. We combine a strong engineering tradition of problem solving with a high level of scholarship and research. 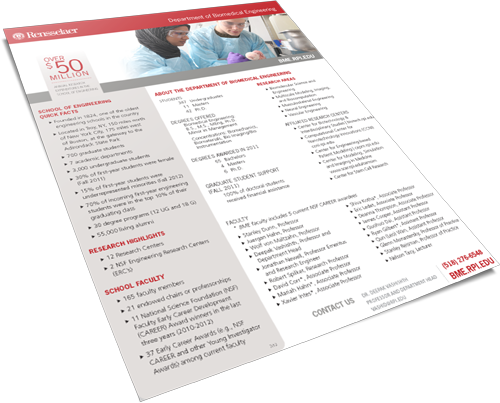 For over 40 years, we have produced outstanding academics, industry leaders and research scientists. The department has undergone a rapid expansion over the last few years and plays a leading role in educating the biomedical engineering workforce of the future. Our faculty and students are engaged in highly interdisciplinary research with research groups from numerous other departments and universities. Extensive collaborations are in place within the Center of Biotechnology and Interdisciplinary Studies, but also with the Center for Computational Innovations, the Biomedical Imaging Center, the Center for Modeling, Simulation & Imaging in Medicine, the Center for Stem Cell Research, and several Boston, Connecticut, New York, and Rochester area hospitals and medical centers. A recent paper authored published in Research in Autism Spectrum Disorders discussed a test that can predict with approximately 90 percent accuracy whether a pregnant mother has a 1.7 percent or a tenfold increased risk of having a child diagnosed with ASD. Congratulations to all BME graduates!